The Antarctic Krill is given credit for helping to keep the balance in the ecosystem around the Antarctic. There is limited food there and a limited number of animals that can thrive in such harsh conditions. Without this particular food source though their entire existence would be in severe jeopardy. 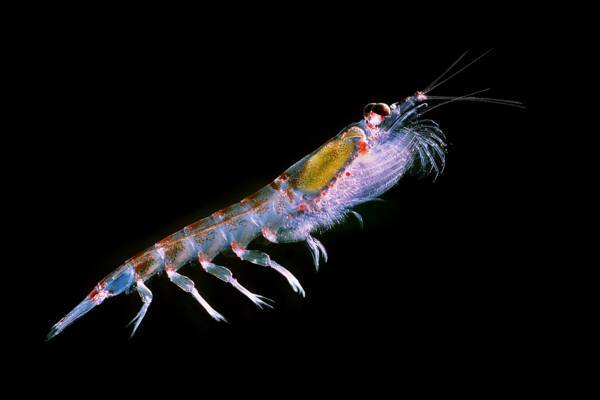 The Antarctic Krill is a very small crustacean that is similar in size to Shrimp. They won’t grow to be more than 2 inches long. They have long bodies that are almost transparent in color. They have areas of green and brown on them that help them to blend into the surroundings. As you may have guessed from their name, Antarctica is where they live in the waters around it. They rely on the various elements in their ecosystem to help them survive. They rely on lots of sunlight and in the summer months it shines around the clock. During that time of the year the Antarctic Krill will live closer to the top of the water. In the cold of winter though they will live in deeper water where it is warmer for them. These life forms live in very large swarms in the water. There can be up to 10,000–30,000 of them in any given location. There is safety for them in numbers but that doesn’t always work. A large predator can come along and consume a very large number of them in no time at all. They have a variety of sub groups that form in these very large swarms but there is still a great deal about hierarchy and communication that experts would love to learn about. The food source for the small Antarctic Krill is the phytoplankton. They are in very high numbers so they really never have a problem finding food to eat. They tend to eat daily but they don’t need large amounts of food for survival. They do have to be careful though because while they are feeding there is also a very good chance that they will also become a meal. There are several spawning periods for the Antarctic Krill. During the warmer time of the year they will have more food and they will make a long journey to the spawning areas close to the shorelines. This is where mating will take place. The females will lay hundreds of eggs each time they spawn. The eggs will attach in the water to various plants or other elements and then go through four larvae stages. The length of time for each stage depends on the temperatures of the water. The Antarctic Krill can live for a period of up to 6 years or more in the wild. However, they very seldom are able to do so. This is due to them being consumed at such a high rate for food resources that others living creatures rely upon. In some locations they are commercial reproduced to be able to create Krill oil that is a common supplement on the market today. The number of Antarctic Krill continues to drop though due to the climate changes. The fact that there isn’t as much ice as there used to be in Antarctica means that there isn’t as much algae forming that they need for food. It is believed that the decline in their numbers has also resulted in the number of Penguins dropping too. Experts warn that if this decline continues the entire food chain balance in the Antarctic can be upset so efforts should be taken seriously now to prevent such a chain reaction.